Welcome, welcome to a certification that is like no other on earth and attaining a viable livelihood for you and your horse. Who'd have guessed it? Horse course, horse school, equine assisted to help people. FOREVER training for the life of your career! WORKING WITH HORSES IN A PROFOUND AND INSPIRING WAY TO HELP PEOPLE! Welcome to a company that cares about your success! We don't just certify people; we work with you to accomplish your success within this horse business field. A Global Equine Assisted Learning Business Training™ (EABT™) company that works together to find success around the world, helping individuals to be empowered and helping them to move forward in their own lives while working with the horse. Through this powerful Horse Course which just isn't a wish; it's a reality, you start your new business with confidence! Live a life you were meant to live with horses and make a living! When a client changes right before your own eyes because the horse has stated something to them to help them move forward and parallel it to their life is so humbling and beyond purposeful. Making a difference in another person's life, and learning the art of facilitating to empower individuals vs enable people is 100 percent the most rewarding livelihood ever! The horse’s welfare is at the foundation of your certification. Using horses for the programs is no way for people to build skills, but rather working with horses as the teachers and understanding what they are saying is how to instil long-lasting learning that is compelling for your clients and safe for your horses. It's about learning the horse's language versus expecting him to understand and adhere to yours. We must thoroughly know how the horse communicates in every way. The welfare of the horse is paramount! We are proud to be partnering with Guelph University to ensure the welfare of the horses comes first in this well established certification. Take a look at our partners for the welfare of our horses! Passion. Purpose. Destiny. Fulfillment. Becoming a Certified Facilitator is about inspiring and helping other human beings build strong skills! Proven programs with RESULTS! Horse learning and horse work are the foundation to the success of the programs and how horses communicate with human beings. We work within a group format that focuses on ground activities rather than horseback riding. We value the well being of the horse and know that a horse can only think like a horse, and that is what makes them the ultimate teacher! You don't need to become a therapist or counselor to conduct these objective driven exercises/programs that come with your course and if you are that just add's a greater approach to help your clients advance in their own lives. We do know, however, that should you work with these magnificent animals, equine therapy exists. This Certified Equine Assisted Learning Facilitator course is revolutionary and gives you everything you need to begin your own successful horse business! Your certification gives you unlimited help and never ends as we must become an expert in our field along with your one-time investment includes the business package; business training; marketing with this horse field; how to secure and retain your clients, credentials and so much more! We’re not successful until you are successful! Starting on a new path in life can be scary but also very exciting, and with our ready-made business certification - you know what to do with your certification. PLUS an online 4 month review training after you are certified to solidify all you've learned with us. Whether you are an entrepreneur or have never started your own business, learn from the industry leaders how to use not only these extraordinary programs you receive but how to market them to your community. We specialize in creating successful facilitators and providing you with the formulation to get your company off and running right from the gate, which is definitely a crucial part of this certification. You are set up right from the get-go to create a living in your career and receive your return on investment within 60 days (ROI). 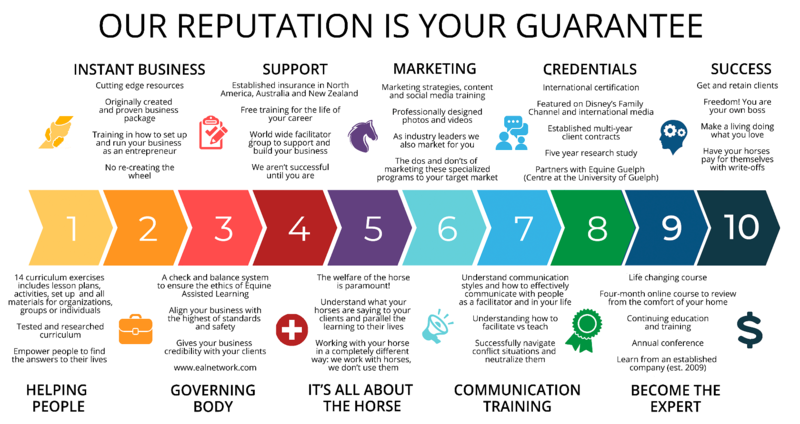 You will belong to a unique, private, empowered equine global business group with expertise, skill, wisdom, creativity, as well as, confidence to move your business forward. We promise you'll have answers instantly within this professional team. We guarantee we are with you for the life of your career with FREE training! It is our wish that your training here will give you all you dreamed of in working with horses to help people—a preview, if you will—of the actual certification. Equine Connection is truly unique, as there is no other certification like this in the world. We hope our website will convey in a small way what makes Equine Connection special and what our potential facilitators will know to expect. Thank you for taking the time to visit with us online. Definition of a Global Company: A global corporation is a business that operates in two or more countries. We are located in Calgary, Alberta and Sydney Australia. We collaborate with global specialists to ensure the 'Welfare of the Horse' comes first. Horses. The Teachers. Why Prey. Your Facility. Your Horses. We Come To You.